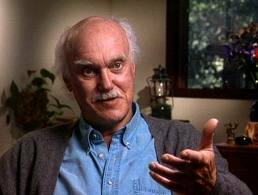 In high school, I discovered hatha yoga, which led me to the writings, and eventually the lectures of Ram Dass (Dr. Richard Alpert). I consider him my first spiritual teacher. He popularized the phrase “Be here now,” which later became the title of a fascinating book. Some recent drama has called me back to these teachings. This excerpt is from a 1988 interview in The Vegetarian Travel Guide. Ram Dass: “…that’s (suffering) the one that is hard for this society to recognize. That is one of the highest mystical teachings, that suffering is great. But who wants that? To hell with that…later, baby. VTG: When one is suffering, it’s very easy for the heart to close down. In my own life when I’m hurt or feeling angry, it’s often an automatic response. What do you tell your own heart when you feel it closing down, when the stimulus is just too strong and you’re ready to run for the hills? Ram Dass: When my heart starts to close down, first of all it’s incredibly painful because you get addicted to having your heart open and staying in that kind of liquid space of just being in love with the universe, like the divine beloved is just everywhere. When it closes down it hurts. What I do is I sit with it the way it is. I don’t try to push away my closed heart, that just closes it further. I just say, ah ha, my heart is closed, and I realize that what is closed will open and what is open will close so that I start to have a little patience about it. And then instead of trying to open my heart by thinking loving thoughts, usually what I do is go back into my breath because the thing that closed my heart was a thought that I had. It was nothing out there. Nobody did anything. They just do what they do. It was my interpreting what they did that closed my heart. And so I can see that what I’ve done is get stuck in a thought form. And what I can do now is go directly into my mind and go back into the rising and falling of my breath until I get to the point where the thought dislodges and I’m just with the thought of the rising and falling, and then at that moment that whole constellation of thought that closed my heart isn’t around anymore. EJR: Do you actually identify what the thought was? Ram Dass: I used to do that. I’m an old psychotherapist so I would say, “why are you unhappy?” or “why is your heart closed and what caused it?” Now I’m not so interested. When you go into the causes then you move into the psychological reality. You’re treating it as real. That’s one strategy, but it’s only one strategy. Sometimes treating the psychological as thought and going back behind it is a much more efficacious manner to get on with it. It is a bottomless well of trying to figure out why it is you’re angry, why it is your heart closes. It just never ends. Musical Milliner by GoshGusMusic(ascap) is licensed under a Creative Commons Attribution-Noncommercial-No Derivative Works 3.0 United States License. Based on a work at sopranoascending.wordpress.com. Subscribe to Musical Milliner Here!